I can’t remember exactly when I bought my first banker’s lamp, but I had one when I lived in Dublin, in 1999-2000, and I have never lived without one since. The lamp is round and heavy. The base resembles a Chinese Stupa, starting with a heavy golden dome surmounted by a golden spintop and finishing in a golden sphere. 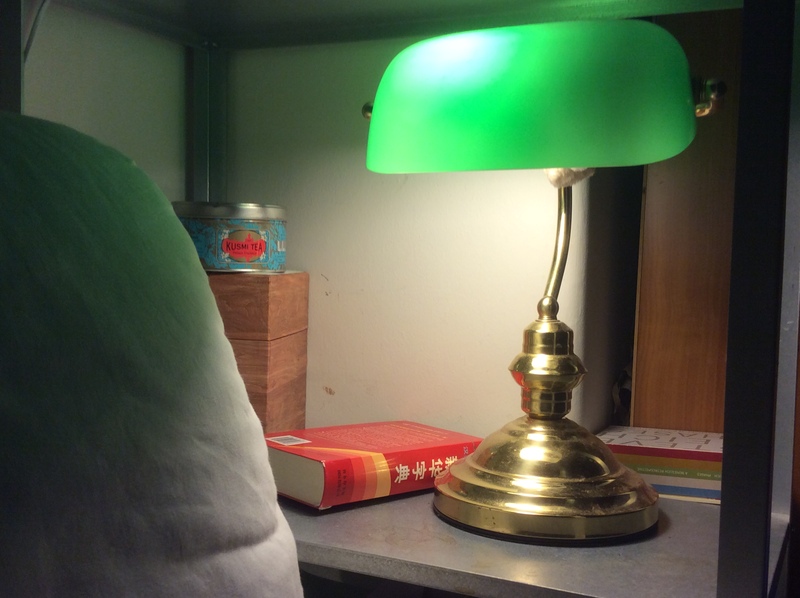 From that little golden sphere, at an angle of about 160 degrees, juts out a thin curved metallic arm which, in turn, supports a horizontal golden two-pronged fork holding an articulated, curved green glass top that hides an electric bulb, and projects a greenish aura when the lamp is lit up. I remember first seeing a green banker’s lamp in a film by Visconti, ‘The damned’. I saw the movie at a small independent art cinema called ‘Accatone’ in the fifth district of Paris when I was in preparatory class, in 1997. The film explores the fall of a wealthy German industrial family corrupted by its dealings with the Nazi regime. In a famous scene, the young son of the family dresses up as cabaret singer Marlene Dietrich and sings ‘Einen richtigen mann‘ at his grand-father’s birthday party, draping a long dark boa round his neck. The gay subplot, the lavish aestheticism of a central-European bourgeois decor, the slow camera work – that film had everything to fascinate young closeted me. About halfway through the movie, we see the library of that German family, with a rich leather covered desk, and a green banker’s lamp. I can’t remember what happens in the scene, but I clearly picture that beautiful, desirable, green banker’s lamp, and ever since, I’ve wanted to own one. Two years later, I got into Ecole Normale Superieure, and started receiving a monthly salary. I guess that must have been the time I bought my first lamp – or maybe it was a year later, when I got to Dublin, moved into my first share-house, and had a gigantic room of my own to fill with beautiful objects. What I do remember is the big surprise I felt when I found out that banker’s lamps were affordable – no more than twenty or thirty dollars. Through this first encounter in film the object had come to signify ultimate luxury – and I have used them as my primary source of lighting for over fifteen years, bathing myself in metaphorical splendour. I have been a serial owner of banker’s lamps. Beauty breaks – and so do they. Fortunately, they’ve become generic enough that no loss is a tragedy. When I migrated, I packed my latest lamp in the 1m3 box I shipped over from Paris. It had a French plug, and I had an adaptor for it. I broke it in 2009, in my St Kilda apartment, dropping it on the floor accidentally, where the glass smashed. The lamp I have now is the first I bought in Australia. And to blend in Antipodean cuteness with that symbol of Continental opulence, I attached a clip-on koala to the stem.